If you're new to the guitar, you are probably eager to learn some songs. 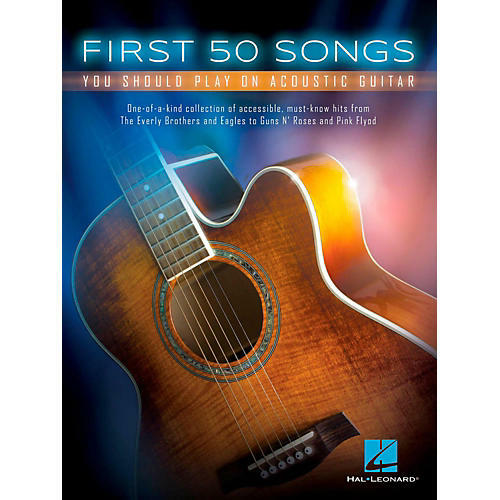 This book provides a combo of tab, chords, and lyrics for the most popular songs beginning guitarists want to play on the acoustic guitar. Includes: Against the Wind / Barely Breathing / Boulevard of Broken Dreams / Champagne Supernova / Crazy Little Thing Called Love / Every Rose Has Its Thorn / Fast Car / Free Fallin' / Hey There Delilah / Ho Hey / I Won't Give Up / Layla / Let Her Go / Mean / One / Ring of Fire / Signs / Stairway to Heaven / Trouble / Wagon Wheel / Wish You Were Here / Yellow / Yesterday and more.